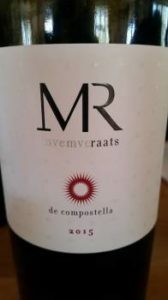 It takes supreme confidence in your intrinsic quality and a particular sense of marketing showmanship to put your wine up against acknowledged Old World benchmarks but that’s exactly what Bruwer Raats and Mzp Mvemve of MR de Compostella did in launching the 2015 vintage. 20 individuals including trade and loyal private buyers were invited to blind taste the maiden vintage 2004 against the Cheval Blanc 2004 and the 2013 against Haut Brion 2013. In the first case, the room was split 11:9 in favour of Cheval Blanc and in the second case 12:8 in favour of MR de Compostella. Subtle but wonderfully complex nose of red berries, violets, herbs, mushroom, undergrowth and spice. Relatively lean with fresh acidity and ever so fine tannins, the finish long and dry. Composed and elegant. Black berries, a brush of vanilla and a hint of reduction. Huge fruit density, fresh acidity and ripe tannins. Sweet in the best sense, the wine still remarkably primary. Red and black berries, violets, crushed herbs, earth and spice. Full but balanced with very good fruit concentration with bright acidity and ripe tannins. Smooth textured in the best sense. Red and black berries plus pencil shavings and even a little burnt toast. Good fruit density and freshness, the tannins firm but fine making for a long, dry finish. The scene set, it was time to look at the MR de Compostella 2015 rated 96 by Tim Atkin MW and 98 by Greg Sherwood MW. 40% Cabernet Franc, 32% Cabernet Sauvignon, 14% Merlot, 13% Mabec and 11% Petit Verdot. Very primary with notes of red and black berries, fresh herbs plus attractive oak notes including pencil shavings, vanilla and spice. Big and rich yet really well structured with great fruit definition, bright acidity and an intricate lattice work of tannins. Immaculately put together, it should reward many years of ageing.